With its 54 large openings (or ports) the ITER vacuum vessel is a challenge to seal completely, and yet ultra-high vacuum is needed for the success of the plasma pulses. 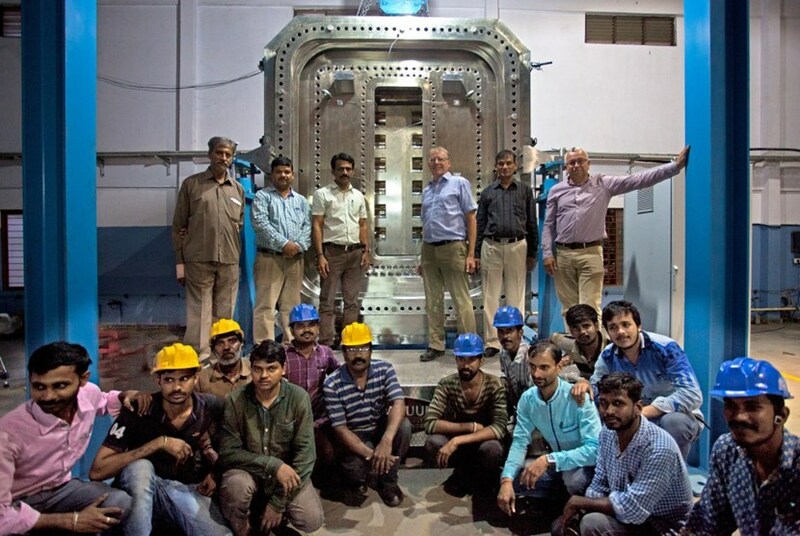 The team in celebratory mood after the completion of the test rig. This full-size replica of the largest of the equatorial ports has been designed to test the vacuum sealing. Vacuum Section Leader Robert Pearce describes the Herculean task: "The largest ports of the vacuum vessel have surface areas of 5 m². But an unsealed area the width of a human hair is enough to destroy the vacuum and halt fusion performance." To leave nothing to chance a full-size replica of the largest equatorial ports has been designed and manufactured to test the vacuum sealing of what will be the largest port ever built on a tokamak. 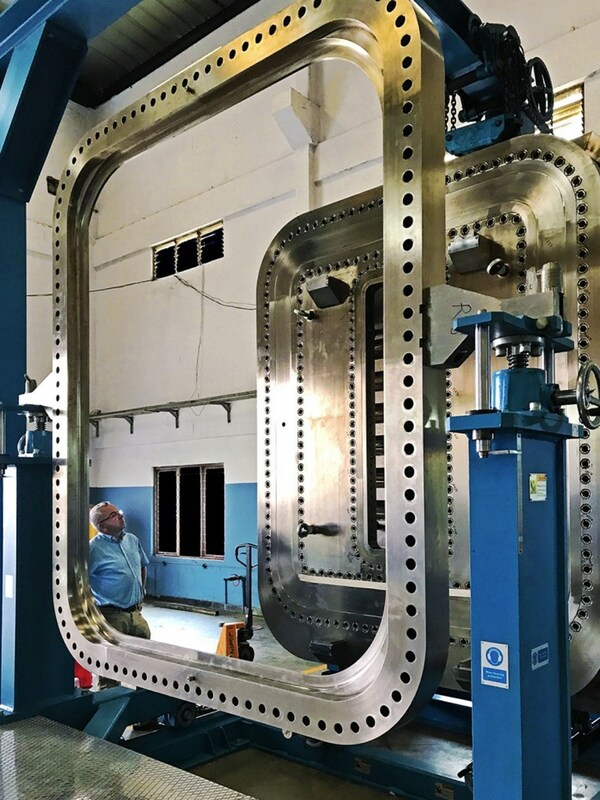 The large seal test rig—4.8m (L) x 3.3m (W) x 4.8m (H)—is ready for factory acceptance testing at Vacuum Techniques in Bangalore, India. This full-size test rig has just been completed by Vacuum Techniques based in Bangalore, India. Vacuum Techniques, founded in 1989, is one of India's largest suppliers of vacuum equipment and a specialist in the design and manufacture of custom built equipment. "Their team of highly qualified engineers, led by Director Rangaroa, has been dynamic and resourceful in completing this key component," says Eamonn Quinn, Vacuum Mechanical Engineer. The test rig is of an impressive size (nearly 5 metres in height and as many in length) and it weighs around 19 tonnes. It gives a preview of how the ITER machine will look when seen through the equatorial ports cells, as they are starting now to take shape on the construction site. It is due to be shipped to ITER shortly, where it will be used to test the assembly and function of a suite of large vacuum seals in order to validate the sealing technologies proposed for First Plasma and the subsequent operational phases of ITER. "The seal test rig not only allows the largest demountable rectangular seals to be tested, but also enables us to prepare installation techniques which will be critical to achieving the required vacuum quality," states Pearce. "The rig can be heated to 240 ⁰C to simulate the baking of the ITER vacuum vessel and it also has the capability to apply loadings to the flanges to confirm the soundness of the sealing."